ST. GEORGE – A tenth member of the Fundamentalist Church of Jesus Christ of Latter Day Saints entered a plea of not guilty in federal court in St. George Monday on the heels of a federal indictment alleging he was part of a multimillion-dollar food stamp fraud and money laundering scheme. In a separate hearing Monday, a federal judge denied pretrial release for South Dakota FLDS leader Seth Jeffs. Wearing shackles and an orange-striped jail uniform, Rulon Mormon Barlow, 45, arrived in court Monday before U.S. Magistrate Judge Robert T. Braithwaite, after turning himself in to law enforcement Saturday afternoon. Rulon Barlow was found to be indigent by the court and was appointed a public defender. He will be represented by Joel Kittrell. 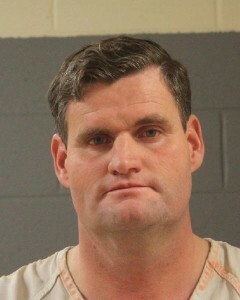 Rulon Barlow is the tenth of 11 members of the FLDS polygamous sect, which has historically claimed the twin cities of Hildale, Utah, and Colorado City, Arizona, as home base, to be charged in a two-count indictment unsealed in U.S. District Court, District of Utah, Tuesday. Federal prosecutors allege the indicted FLDS members conspired to commit Supplemental Nutrition Assistance Program benefits fraud and money laundering. Prosecutors allege FLDS members receiving food stamp benefits were directed by church leaders to give their government-issued benefit cards to the church. Money from those accounts was spent at church-run stores and businesses and otherwise diverted, the indictment alleges. Terms and stipulations for Rulon Barlow’s early pretrial release were negotiated and agreed upon by both sides prior to his initial appearance. Braithwraite signed the agreement, stating Rulon Barlow would be released from custody once he was taken back to Washington County Purgatory Correctional Facility for processing following Monday’s hearing. As this report is published, an eleventh FLDS member named in the indictment, Kimball Dee Barlow, 51, of Hildale, is still at large. A status hearing for Rulon Barlow and nine other defendants indicted in the case has been rescheduled from March 21 to March 22 at 1 p.m. in St. George’s federal court. Also Monday, South Dakota Federal District Judge Danetta Wollman agreed with prosecutors that Seth Jeffs, the brother of incarcerated FLDS leader Warren Jeffs, is a flight risk and denied Seth Jeffs’ pretrial release. Wollman ordered Seth Jeffs transferred to St. George to face allegations in the indictment. Among others named in the indictment, Nephi Steed Allred, Preston Yates Barlow and Hyrum Bygnal Dutson pleaded not guilty in court before Judge Braithwaite Friday.Allred surrendered himself to law enforcement Thursday and Preston Barlow and Hyrum Dutson surrendered themselves Friday. Winford Barlow, Ruth Barlow and Kristal Dutson, also included in the indictment, were arrested Tuesday and booked into Washington County Purgatory Correctional Facility. The three entered pleas of not guilty in St. George’s federal court Wednesday and were released from custody Thursday under supervised release, which includes travel restrictions and GPS ankle monitors. On Wednesday, FLDS leaders Lyle Jeffs and John Wayman also pleaded not guilty to the two-count indictment in federal court in Salt Lake City. A hearing for Wayman to determine if he will be jailed pending trial is scheduled for March 10. A similar hearing for Lyle Jeffs is set for March 7. As the case moves forward, the potential penalty for the conspiracy count is five years in prison, while the money laundering count carries a potential penalty of 20 years in prison. I have to look at this guys name and wonder if he prefers Rulon Mormon Barlow or Rulon “LDS” Barlow. This is good news. Stop and dismantle the corruption of the FLDS crime organization. It’s disgusting. We the people say, it’s about time.